After staying in Bucharest for about a month and a half, it practically felt like home - so here's the longest post we've written as of yet! From time to time, we enjoy taking the time to really experience the culture of a place and feel like locals… and also have some more down time to get design work done! After getting a solid taste of of Romania's capital city, I would say that overall it seems to be an eclectic mix of a post-communist state and a rapidly BOOMING european-bohemian city. For the majority of our time here, we stayed in an apartment in the Historic Lipscani District. This older part of the city, decorated with ornate French-style architecture, would have probably extended a lot further today; but sadly, Nicolae Ceausescu’s Communist regime and a series of strong earthquakes prevented that from being a reality. Now you just see beautiful Belle Époque buildings right across the street from big communist-era apartment blocks. Voilá, history reflects itself so vividly right before your eyes, gotta love it. But then you have the Centrul Civic District with even more notable effects of the Romanian Communist regime… the People’s Palace. It’s. HUGE. I mean, really MASSIVE. In fact, it's the heaviest building on Earth, and apparently the most expensive administrative building. Many locals say Ceausescu built it that big to match his ego (ha ha). In the 1980s, a huge amount of historical buildings were demolished in the Centrul Civic area and 40,000 people were evicted from their homes with just a day's notice to make space for 8 square km of socialist-realist style government offices and apartments. Not nice Ceausescu, not nice. We kind of ended up avoiding this part of Bucharest's center during our stay, preferring areas North of the river. There, you see a great effort to renovate the streets and old buildings... but don't expect any protection or western-style security around the construction sites! Getting back to Lipscani, it really does look like Paris! So much so, that it gave Bucharest the nickname “Little Paris”. It’s a super fun area to live in too. The streets are animated 24/7 with young people everywhere and bars upon bars blasting the latest top 40 hits. On weekends, you'll probably find a few latex-thonged lady-dancers or buff fire-breathers–it's totally standard club decor here. The clubs stay open all night... as in until the sunrise–sometimes even on a Tuesday. If you'd like to stay away from the clubby naked-dancer thing, fear not! There are plenty of alternatives :) There are a few lounge-y bars in the area which we loved, like the Pura Vida rooftop bar (Sky Bar), Biutiful, Nomad, Bruno Wine Bar, and Bazaar; and some more laid-back "alternative-rock" bars like Mojo Club (British ex-pat bar with karaoke every night and a basement dance club) and 1974 Niste Domni si Fiii (local, cheap, rocker hangout) - Lot's of indoor-smoking happening inside both of these tho. There's also great dance bar/clubs in the area that play cooler, less-mainstream music than the bars on the main strip; like Interbelic, Control, and El Dictador. Rooftop bar above a hostel where you can enjoy a nice glass of wine and watch the sunset. Very relaxed ambience. It's also a great place to meet expats and fellow travelers! Sometimes they project football matches or films on the wall of a neighboring building. The main bar streets (like Strada Selari, Strada Smardan, and of course Strada Lipscani) fill with swarms of young people on the weekends... and on every other night of the week. DJs, lights, loud music (live music too), and all the beer that will keep you dancing 'til the sun comes out. A dance club "for people who don't like dance clubs" known for it's great music and DJs. It has a relaxed outdoor area to take brakes between dancing. Nice little decoration we found inside this lounge-y cocktail bar. Hip clothing boutique and bar. In between Lipscani and Piata Romana, all along the Calea Victoriei is where you'll find the artsy-bohemian crowd of locals. 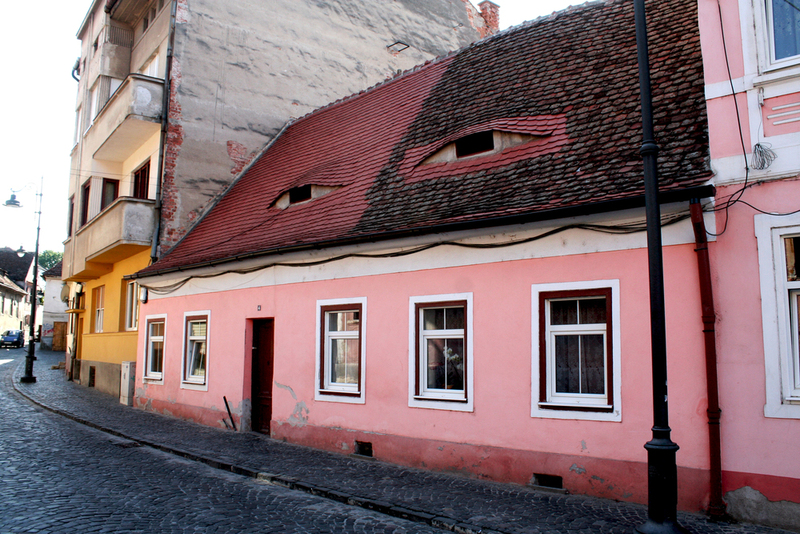 Once we found our way to the relaxed artsy scene in Bucharest, we really started to feel at home. 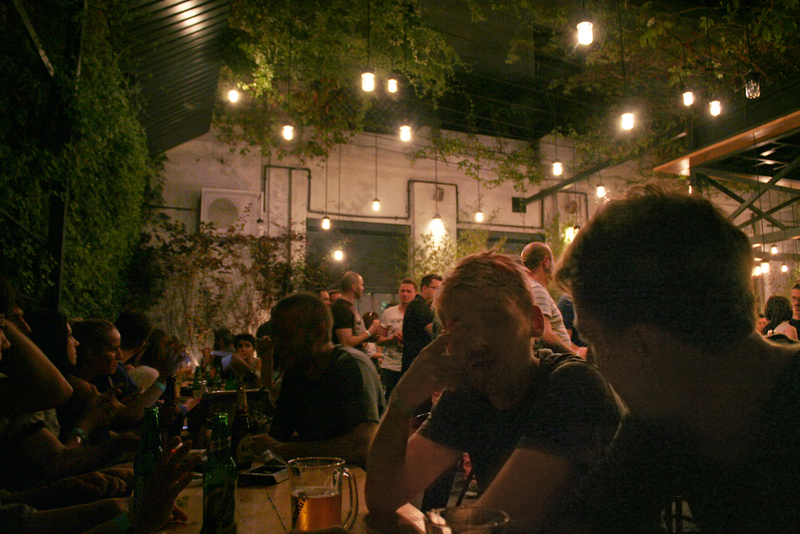 Places like Gradina Eden (hidden behind Palace Stirbei), A1, and A2 were definitely among our favorite hangout spots. And traveling a bit further north, you find Terasa Baraka and Tête a Tête hidden amongst the trees of Herastrau Park. All of these bars have a very laid-back feel and usually pack up with creative-types and hipsters. Some even have hammocks and fruit smoothies, and they all also function as cafés during the day. Outdoor film screenings, picnic chairs, and beers under the stars - a family friendly bar. Café, bike shop, vinyl shop, bar, restaurant, and a very chill attitude... what more could you ever need? Great by day and night, an amazing space with hammocks, beer, and a fruit smoothie bar (mmm goji berries)! Beautiful café-restaurant-bar with a great ambience and delicious food. Great food, in a calm outdoor setting. Cocktail bar with hammock chairs in Herastrau Park. A non-drinking activity we loved and would highly recommend is taking a stroll (or a morning run) through one of the many beautiful parks in Bucharest. We frequented Cismigiu Park to lay out in the sun and have a freshly squeezed portocale (orange juice) while we watched locals enjoying the little paddle boats and playing chess and backgammon. Herastrau Park is great too, only it's much bigger and has more cafés, bars, and even a skate park. This park had a big space with a stage, "book trees" and bean bag chairs where family friendly events were held (although it's probably mostly used during the summer). It's a great park for a morning run! Many people rent paddle boats or canoes here as a fun daytime activity. Interactive artwork in the Images of Nostalgia show (part of EBienale). Art Videos in the Images of Nostalgia art gallery show opening (part of EBienale). Old communist-era photographs exhibited in the gallery. An exhibit of a huge map showing the location of churches vs schools in Bucharest. There are many art-related activities to do too. The Kulturama exhibit space in Piata Revolutiei is worth checking out to see exhibitions and artistic events that promote young talent. There are also constant art gallery shows... we went to like five of them. The art is usually really cool and creative... and the complimentary wine is always nice too. There are lots of museums and tours to check out too... but with so much to see, we didn't really fit those in. We did however, get a lot of design work done, and got to know the best coffee shops and co-working spaces. My personal favorite was M60. The coffee, the food, the ambiance, power outlets everywhere, comfy chairs, amazing service – it just can't be beat! Other great ones include Tucano Coffee (the one by Piata Romana is the best!) and the pay by the hour co-working space Seneca Anticafe where you get a little check-in bookmark with a famous writer's name (no coffee here though, only teas). Carturesti Carusel is also worth checking out. It's a bookstore/café/event space/gallery in a beautifully reconstructed old building. Another cute but smaller spot is the Libraria Humanitas near Cismigiu Park that has a café area and a great selection of teas. Bright, natural lighting, comfy chairs, and power outlets make this a great place to sip on some tea, focus, and get some work done! Part Scandinavian office - part eclectic living room, this cafe is a great space to get work done. It has great coffee, teas, and a delicious alternating menu. The alternating menu keeps you trying new, deliciously creative food. A great co-working space where you pay per hour and get unlimited access to tea, snacks, printers and other office-y things. You get a little check-in bookmark with a famous writer's name to keep track of how long you stay in the café. Then you pay per hour at the end, when you return your bookmark - such a cute idea! The kitchen is pretty well equipped with unlimited little snacks to keep you going, however you won't find coffee here, only a large assortment of teas. It can get a little hot in this café, but the environment is very creative andthe food/coffee is fantastic. This place has a creative seasonal menu with some vegetarian and vegan options. A super cute bookstore and event space with a café on the top floor. In the end, it was a bitter-sweet goodbye. We were sad to leave the great new friends we made, but thrilled to start our next adventure! We have a ton of Serbian friends from New York, so we figured we should see what their country is all about! We quickly found out that the Serbian spoken language is pretty much exactly the same as Croatian. So even though we weren't able to read any of the cyrillic, we could at least strut into Belgrade knowing how to say "please" and "thank you" ...but we also quickly learned that all the conflicts and hatred that lie between the ex-Yugoslavia countries is still very prevalent. Our New York Serbians hooked us up with a cool friend of theirs, Alex, and he showed us around the city. At night, he took us to a really cool neighbourhood that I’m sure tourists never get to see. It was right up our alley and kind of felt like being back in Bushwick: Savamala, Belgrade's self-proclaimed Creative District. You pretty much walk from industrial and abandoned warehouses on one block to super trendy bars & clubs on the next. And all this with a splash of colorful and imaginative street art in every corner! First, we went to a cool concept-store/bar/event-space called Mikser House. It was so beautifully designed I swear I wanted to buy everything inside. Then later, we had a few drinks in Tranzit, a bar/lounge/club with amazing music, a cool ambiance, and a nice terrace overlooking the Sava River. Other party alternatives include more boat bars and lots of dancing in crazy late-night clubs, but we decided to skip those and have a few days of rest. In conclusion: Belgrade is beautiful and so much fun! Zagreb. Our last stop in Croatia. And our last stop with Marine. After this, Marine will go back to France and we will move on to Serbia. It's so sad to say goodbye after so many good times together! But I know we will meet again soon, so I will wipe the tears off of my laptop's keyboard and I'll tell you a bit about Zagreb. Zagreb is a really cool city! It has a pretty large metropolitan area and a smaller historical center filled with cute pedestrian streets and beautiful architecture. There's also a cute strip with fun bars and restaurants. In the old town, we found a super quirky shop with unique jewellery and other trinkets called PMS: Prostor Manufakturne Slobode (that's Croatian for Manufacturing Space of Freedom). The eclectic lady that runs the shop told us about a live blues concert that was happening that night in Zagreb’s oldest tavern. Sure enough, we found Pod Starim Krovovima (another odd name which translates to "Under the Old Roofs") and all its surrounding bohemian crowd. It felt like we were transported back in time in that cozy tavern that reeked of beer and cigarettes. Everyone was smoking inside (because that’s what people do in Eastern Europe) and the blues-y tunes were heartfelt and soulful. It was an incredible experience and I’m so glad we went! Dubrovnik is Kings Landing. Shame stairs and all. No joke, Game of Thrones was filmed all over this town. I’m so glad our Hawaiian friends urged us to go there because WOW it’s sooooo gorgeous!! It was my favourite stop in Croatia and I’m still dreaming about it. Everything there was absolutely magical and the pictures don’t even do it justice. We stayed in an adorable airbnb with grapevines in the patio and just a short walk away from the center. We made friends with some cool Spanish musicians that ended up serenading us songs until the break of dawn which by the way is ABSOLUTELY BREATHTAKING in Dubrovnik and if you can do it, it’s a MUST. We had octopus burgers in a nicely designed family-run restaurant and we made friends with a girl that worked in a wine bar. She later left the bar open for us that night when the other bars were closing and we ended up having a real FIESTA with the Spanish music, the delicious wine and all the new friends we made. Absolutely unforgettable. The first thing we noticed upon arriving in Split is that people there love to bathe in the beaches at night. A bit of a strange tradition, but I like it! Split has a really beautiful historical center and it’s where some Game of Thrones scenes were filmed. And of course, we found a cool hidden jazz-wine bar in the midst of all the neon lights and mainstream clubs (check it out: Marcvs Marvlvs Spalatensis). After we got a few drinks in us, we jumped right in the water with all the locals, and swam straight to a floating bouncy castle! What a great night! In Split we sort of hit a bump in the road (quite literally) when Marine’s car got a flat tire. No biggie, 5 euros go a LONG way in Croatia and before we knew it, we were heading off to the National Park Krka! The park was so beautiful with waterfalls so romantic, they ooze with poetry! After a few hours of fun in the park, the winds start picking up and the clouds start to settle in. Guess what? A HUGE STORM just showed up out of nowhere, completely uninvited and with an attitude problem. We scrambled our stuff together and hid in a souvenir shop. The boats heading back were too packed so we stayed in this crammed shop with about 50 other tourists and had a picnic! Hell, a little rain won’t put our spirits down! We shared some chips and wine with the family siting next to us while our friend went out to check on the situation and walkie-talkied us the updates. Everyone in the shop was happy to get the lo-down on the boats and we were all able to get back without barely getting a drop on us. haHA! The power of the walkie-talkie! After about a 5 hour drive through Italian and Slovanian landscapes (and border crossings), we made it to our first stop in Croatia! 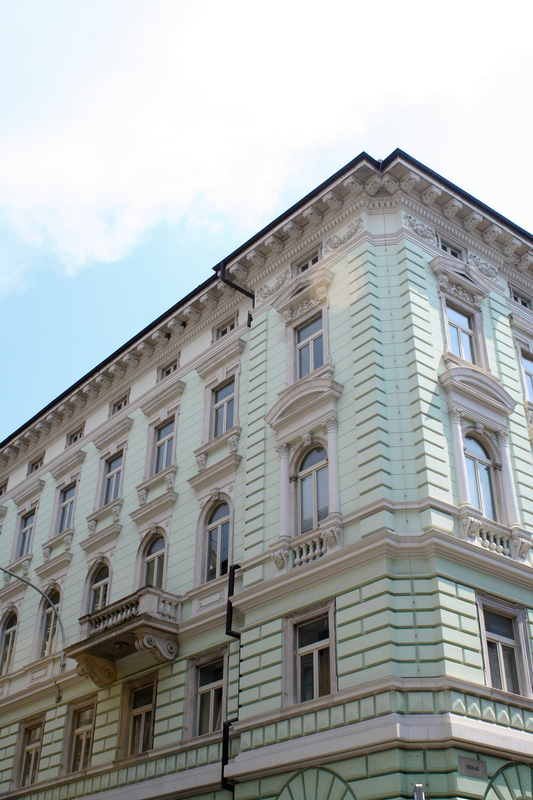 Rijeka has a bit of a raw and rugged beauty, but after traveling in more comfortable and familiar places in France and Italy, we welcomed the change with open arms. The language is now too unfamiliar for us to decipher, the currency is no longer Euros, and the buildings are all a bit run down and destroyed. We have reached eastern Europe! Driving in, we saw Rijeka's large port with hanging cranes that looked majestic with a light cloud of mist hanging in the sky as the sun began to set. We settled into our sad excuse of a hostel and quickly made some friends. Later that night, we would find out that we were staying a stone throw away from all the best parties. The port area is lined with bars and clubs in every direction (some even on the water). Truthfully, they were all a little on the trashier-mainstreamy side, but that was part of the fun. And on weekends, they stay open ’til the sun comes up in case your feeling extra energized and want to keep dancing all night long! During the day we wandered around the open air markets that offer an endless array of cheap and delicious fruits, veggies, meats, and seafood. We also found some very cool artsy-hipster coffee shops (check out Dnevni Boravak Cafe). Then, midday came along and it was boiling hot. The large pedestrian street in the centre of the city, where all the shops and fashionable boutiques are, seemed like an endless desert. Our hostel’s AC was down, so we went on a mission to find a fan, and after some pro hand gesturing, we were miraculously directed towards a mall. The helpful local guy said it was a bit far but we decided to try walking anyway. I’m glad we did, because otherwise we wouldn’t have stumbled upon the beautiful rock beaches on the way! We decided to stop for a quick dip and wow, it was gorgeous! The water was perfectly crisp and refreshing. Exactly what we needed. After getting the fan (and WALKIE TALKIES CAUSE WHY NOT) we were getting a bit hungry. That’s when we found Konoba Na Kantunu right by the water. I highly recommend this restaurant. The food, the service, and the price were all worth going back again everyday. I still dream about those fresh anchovies and the octopus salad… Mmmm. 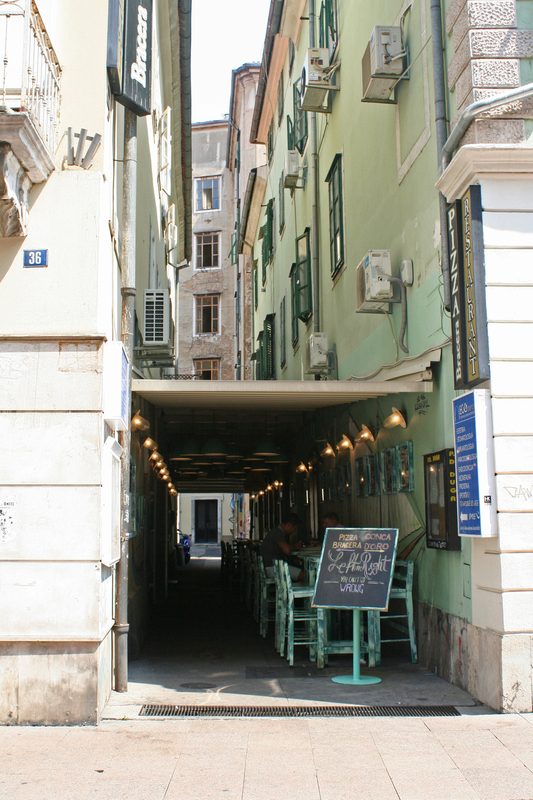 Overall, Rijeka seems to be a little grungy-artsy city that fills up in the Summer with in-land Croatians for parties and swimming - definitely worth checking out for a few days! Fun Fact: Croatia in Croatian is Hrvatska which actually sounds more like "Krvatska" (and not at all really like "Croatia").